Donna Carver | Morrow CountySsentinel Attorney Jerry Peer, standing, enters a Not Guilty Plea on behalf of Christopher Filos, right, former owner of HPM Mt. Gilead. Filos was arraigned Monday morning on one count of illegal storage of hazardous waste. Christopher Filos, former owner of HPM in Mt. Gilead, was arraigned in the Morrow County Common Pleas Courtroom of Judge Howard Hall on Monday morning on a new felony charge issued by the Ohio Attorney General’s Office. Filos appeared in court July 13 with Columbus Attorney Jerry Peer. He was arraigned on one count of illegal storage of hazardous waste under ORC section 3734.02, which is an unclassified felony. The charge stems from his time as the owner of HPM. The property required environmental clean-up by the Ohio EPA. Filos entered a plea of Not Guilty to the new charge. Filos had originally been indicted by the Morrow County Grand Jury in January of 2012 on three counts: Count One, aggravated theft, a felony of the third degree; Count Two, failure to remit state income tax withheld, a felony of the fifth degree; and Count Three, theft, a felony of the fourth degree. 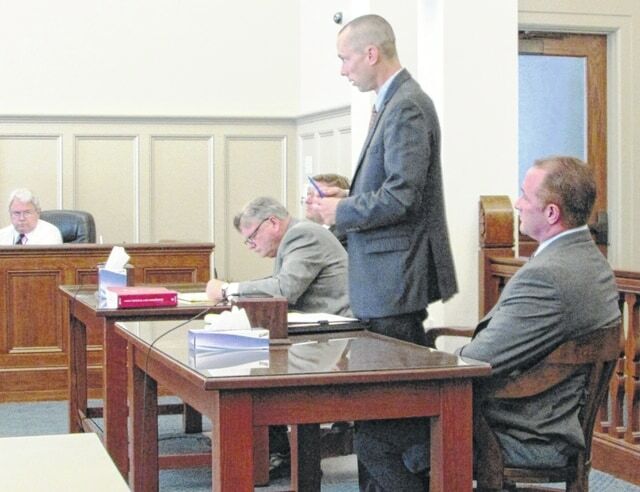 The trial for those charges was to begin this morning, however, Filos’ attorneys filed a motion to continue on Thursday, July 9, and argued at a pre-trial conference on July 10 that they had recently received names of new witnesses and documents from the Morrow County prosecutor’s office they had not previously seen. Judge Hall issued a continuance on that case, setting a new combined pre trial conference date of July 27, at 1:00 pm, and a new trial date for the original case was scheduled for August 24, 2015. Peer informed the court that he would be representing Filos on both cases. Asst. Ohio Attorney General Robert Cheugh represented the State of Ohio at Friday’s hearing and explained they would be unable to appear on Monday, July 13, and requested that Morrow County Prosecutor Charles Howland appear on their behalf. There were no objections to the request. It has not yet been determined if both cases will be combined for trial. That decision will be determined between the Ohio Attorney General’s Office, Morrow County Prosecutor’s Office and Filos’ attorneys. Previously, Filos had not been required to appear in court at pre trial conferences. However, at the Monday morning arraignment, Judge Hall ordered Filos to appear in court at any future court proceedings. Hall also explained that Filos would need to be booked at the Morrow County Jail immediately on the new charges, but was to be released on his own recognizance. Reach Donna Carver at 419-946-3010, ext. 1804 or on Twitter @ MorrCoSentinel.